Halloween is just around the corner and so we thought we’d take a little time and share one of our favorite guests of all time with you! Patty Meyer from the Felt Mansion joins us and talks about some of the real-life ghost phenomena she’s experienced. It’s fun. It’s incredibly interesting. And honestly, it’s a little creepy! We also are in the studio with RepcoLite’s own Rick Wierenga and he’s dishing out all kinds of tips and tricks to make your next painting project as simple as possible! Segments 1 & 2: Painting Tips from the Pros! Painting projects don't have to be complicated. In fact, once you realize a few of the tips and tricks the pros use, you'll be amazed at the results you can produce! Today we're joined by RepcoLite's own Rick Wierenga. Rick's been working in the paint world for what seems like forever. And over the years, he's learned the best and quickest ways to apply paint and still produce excellent results. We're going to corner him and make him tell us everything he knows. (At least as much as we can cram into a segment or two!) So grab a pen and paper for notes and tune in! Maybe you've seen these little pests around your home this fall. Maybe you haven't spotted them yet. Either way, they're coming! We'll talk about what you can do to protect your home from a very invasive species! Every now and then, it's important to just have fun. That's the whole point of this segment. Absolutely ZERO home improvement value. Yet, it's absolutely one of our favorite segments of all time! 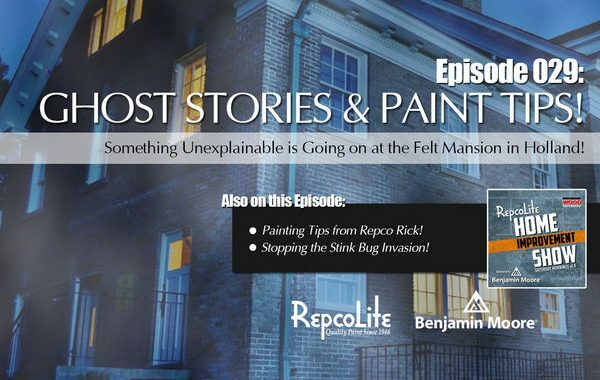 Patty Meyer from the Felt Estate in Holland joins us and tells us a number of chilling ghost stories--events she's personally encountered while restoring the Felt Mansion to it's former glory.